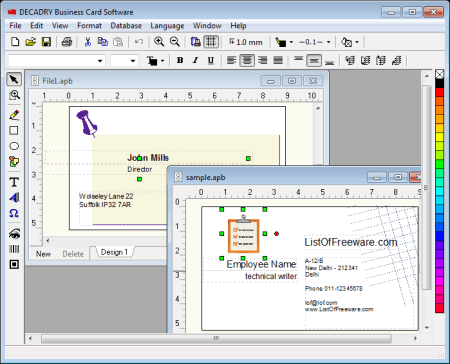 Here are 7 best free business card maker software for Windows. Business card is a small card which contain some useful business related information of company or individual, information such as: contact name, occupation, address, contact number, email address, website, etc. It can be useful for promoting business and also for sharing some useful business information in a quick way. All these software can design business cards and they can also design both sides. You can effectively use them for making high quality and creative business cards. They provide some useful editing features, such as: designing templates, setting card layout, setting a background image, text editing features, inserting images, inserting clip arts, inserting logos, etc. Some of them can also design multiple cards simultaneously and some can also export them to popular images and PDF file formats. Let’s see each of these free business card makers linearly. You may also check out collage maker, 3D modeling software and DJ software. 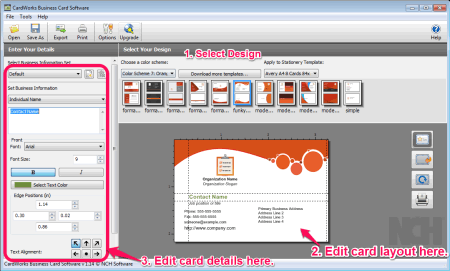 Page Wonder can be effectively used for making greeting cards and business card design. For designing them, it provides many useful features, such as: insert image, insert 3D text, insert picture, draw shape, draw frame and draw grid. It can also design multiple cards in multiple tabs at a time and it can export card image to BMP, JPG, GIF, TIFF, PNG, etc. file formats. It is also a very small software with setup file size less than 500 KB. Formtec Design Pro can create many different type of cards and designs, such as: business card, cards, postcard, labels, photo stickers, etc. It provides many effective tools for that, such as: text, shapes, clip art, images, gradient, label, UDF label, barcode, etc. It can also assemble business cards properly on a paper for printing. Free Business Card Maker is a business card designer which provides some reasonable good features, such as: setting card background, insert images, insert text and setting card layout. Its printing feature lets you print a specific number of cards on a page. It has a small interface and is a light-weight software with setup file size of 1.2 MB.